Make sure you have everything you need to make the best pancakes ever with a selection of pancake-making utensils from OXO (oxouk.com). We’ve teamed up with the kitchen tool experts to give away three bundles of pancake goodies worth more than £50 each. 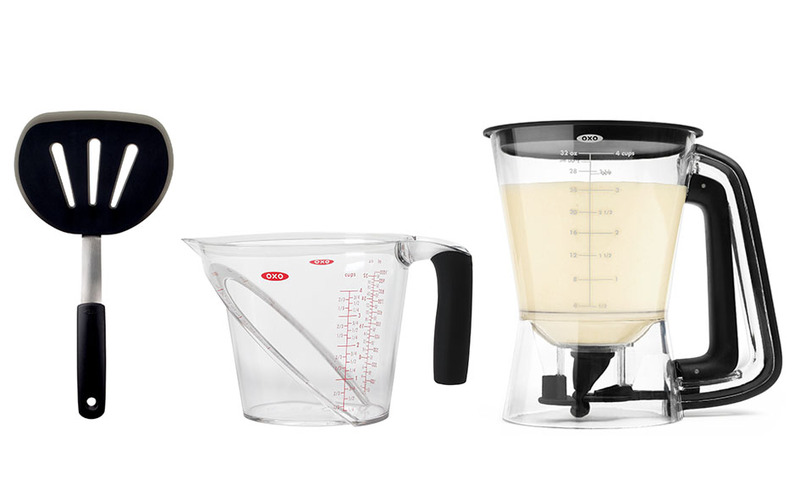 Measure ingredients using the 1-litre Angled Measuring Jug, and mix it up with the 11in Whisk. Using the Precision Batter Dispenser is a less-mess revelation – the simple pull trigger lets you easily control the amount of batter released, and the wide-top opening makes it easy to pour the pancake mix in. When cooked on one side, the Silicone Flexible Pancake Turner allows you to flip it over with ease. Very stylish products for perfect pancakes! My friend makes pancakes every Sunday and I am very envious. This set would help me to do the same…. yes please! Really need this, love pancakes. love shrove Tuesday….this will enhance the day. My grand childrens’ favourite pudding.